Published on 25 June 2012. 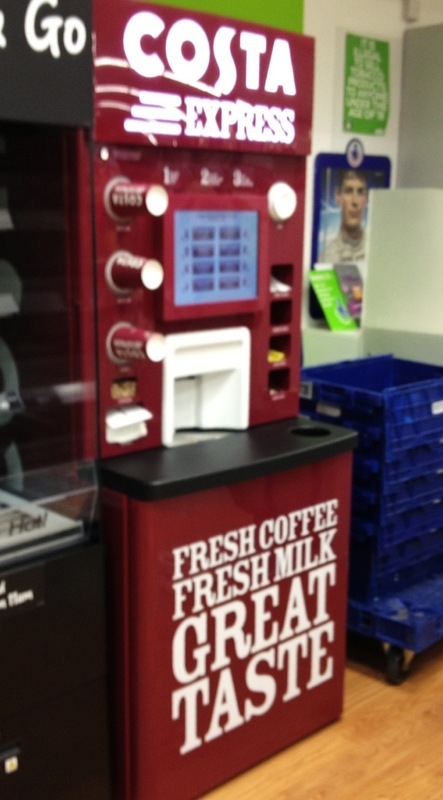 This Costa Express machine is in my local Asda, but they’re spreading all over the place at the moment. When they were first announced, I ridiculed the idea: Costa, Britain’s biggest coffee chain, had just spent a whole heap of money on ads to convince us that their coffee was different because it was made by highly trained baristas, not monkeys with machines. Then they decide to brand, erm, machines. It didn’t make sense to me. But it turns out that I was wrong. I recently read that these machines have been doing a roaring trade, and sales have soared in places where they’ve displaced other machine brands. Which just goes to show that I know nothing about retail branding! This 1,700th post was filed under: Photo-a-day 2012, Retail. Trackback received at 22:45 on 6th July 2012.